Games like craps can be exciting and fun to play but it is important to find a good online casino that is easy for all to enjoy and have fun with when playing craps. The Vegas Casino Online space is a good spot that craps players and others can enjoy. 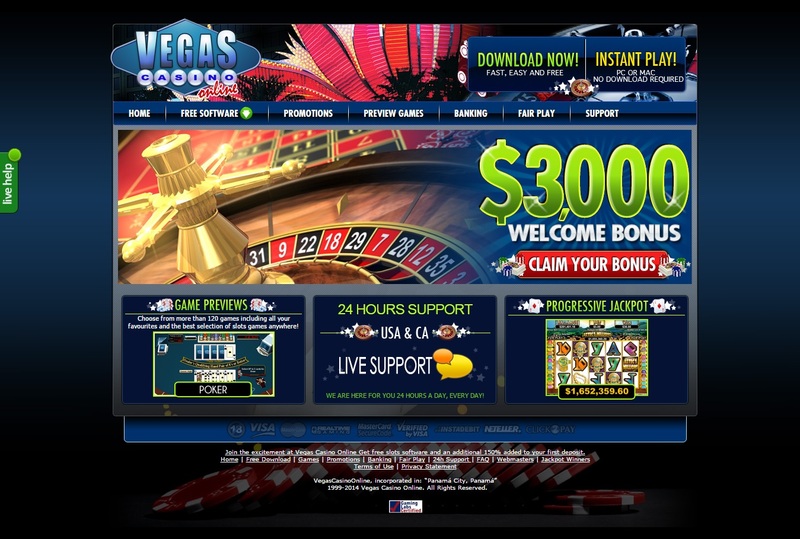 Vegas Casino Online is a site that operates with RTG software and has a license in Costa Rica. The site allows American players to come along and play craps games among many others. The intention of the casino is to give players the experience of playing in a real Las Vegas casino by providing people with an extended variety of casino games. The site has been around since 1999 and is owned by the Main Street Vegas Group Casinos organization, a company devoted to online casino activities. The site is popular for having an extended variety of games. There are many table games to choose from including many traditional card games and numerous blackjack variations. There are also numerous video slots and video poker options to choose from here. Bingo and keno games are available here as well. The craps games that are available here include games that take place on a realistic-looking table. The games are designed to have some appealing graphics and feature all the sensible points that are to be used on a traditional craps table. This makes it very easy for people to enjoy playing games on this site. The dice are especially realistic and do not seem to prefer one specific position above all else. These craps games can be enjoyed in either a downloadable or browser-based template. Each appears to be the same in terms of its quality. The bonuses at the Vegas Casino Online spot include deals that will vary based on the games that one wants to play. Also, there are daily bonuses that entail match bonuses throughout the week but the values will vary based on the day of the week that is being highlighted. The deposit methods used on this site are amazingly easy to use. Visa and MasterCard transactions can be used as well as MST Gift Cards. Money orders can be handled as well. Players outside the United States can also use the Neteller system. All of these work with no added fees. Withdrawals can be taken care of without any fees as well. Check transactions, ACH Direct Deposit, Neteller and money order options can be utilized for all withdrawals. The best way to describe the Vegas Casino Online is that it is a spot that offers plenty of fun and realistic games for craps lovers and others who enjoy a variety of casino games. The spot is easy to play with and has a fun environment. It’s easy to get into the casino and get the most out of it as well.